Yeah, that's literally every weight(except 120 lately, for some reason), every year, every cycle. Trackwrestling top 100 for 2019. Overall a solid list, but there is quite a bit there I disagree with. Connor Brady too high, Chlebove probably 15-20 spots too low, then there are several guys in the 60s-80s I'd move up a lot. The first postseason Top 100 list is out and a pair of Colorado natives are at the top of the class for 2019. Andrew Alirez and Cohlton Schultz check in at No. 1 and 2 on the list after becoming four-timers in Colorado and adding to their impressive credentials outside their age groups. Alirez, a Northern Colorado recruit, scored a technical fall win last year against Penn State All-American Nick Lee at the Junior World Team Trials and defeated All-American Joey Lazor and two-time NCAA champion Dean Heil on his way to a fourth-place finish in January at the Dave Schultz Memorial International. Cohlton Schultz grabbed a Greco-Roman Junior World bronze medal last September and qualified for the USA U23 Greco-Roman squad. The Arizona State-bound heavyweight ran through his senior season without surrendering a point. Schultz is one of six Arizona State recruits who cracked the top 70. A pair of Ohio State recruits, Greg Kerkvliet and Carson Kharchla, and Michigan recruit Kurt McHenry round out the top five. The Buckeyes also picked up pledges from No. 10 Jordan Decatur and No. 22 Dylan D'Emilio. sem, construxboy, JC and 1 other person like this. No brainer. He was fun to watch the past couple of years. why on earth would he take that job? I'm pretty sure I remember hearing there's bad blood between Donny and Wisconsin. He didn't leave on good terms IIRC. Unless there is an administration change and Bono is fired I don't see Pritzlaff going anywhere. Kyle Dake has accepted his 79kg Final X berth. There was lots of speculation he was going to wrestle 74kg this year. The US Open is going to be fire once again this year. I can't stop thinking about how awesome the Open was in 2017 and I hope we could see something similar again (although Final X kinda gets in the way of that quite a bit). Juniors is going to be amazing. Lots of loaded weight classes. Lots of good kids already registered, lots of studs still yet to register. 57kg is already loaded and we're still a week out. Vito is qualified for senior WTT, will he skip Juniors? Will Kurt McHenry wrestle? Malik Heinselman? I'm surprised but not surprised. I wouldn't be shocked to see him land a job at Oklahoma somewhat immediately. Best of luck, Logan. JC, dukebuckeye and SugarShaun like this. Obviously scared of the Zain train. Did look like he was consistently starving himself to make weight, at least he got a world gold. Makes me feel old. I remember following the Monroeville Four as they were dominating over a decade ago. Still disappointed Phillips went to NC State. Chael Sonnen works for ESPN, not the UFC. It's like Michael Irvin offering LeBron a job with the Cowboys. I'm not sure Zain is Top 3 at 65kg at this point. Not even sure if he's wrestling next week yet. Looks like it's Ohio RTC for Logan, plus opening his own academy. It was at a non olympic weight in an olympic year, but yeah, it's still a world gold. His gold medal was in an absolutely stacked weight class though. And he had to go through Shuptar, Ehsanpoor, Chakaev, and Lomtadze to win his gold. Let's not minimize his gold medal because it was a non-olympic gold. That is a murderers row of opponents right there. SugarShaun, GGCD and RockHardEnis39 like this. Just saying, Stieber is an all-time great. A couple years back Askren and Rowlands had a podcast and they ranked their all-time top 10 American wrestlers. A lot has changed since then, but if Stieber isn't top 10 on that list now he's right on the outside peeking in. I think you need a little more on the international resume to make top 10, personally, but if that's not the 'main' criteria he's already there. Lot of guys making a charge up that list in the last few years. Kyle Dake was on Askren's list at #10 two years ago, and Cael was #5. Stieber still has better wins than Dake overall (although more losses as well). how is steiber anywhere near guys on that list, honestly. Because he's one of the great prep wrestlers of all time, one of the great college wrestlers of all time, and won a gold medal. His resume is pretty similar to Dake's and Cox tbh, and I'd put him over Taylor. We'll prob have to amend this list in a few years for the Spencer Lee/Yianni D/Gable Steveson generation and obviously 5 of the above guys are still active, but I feel pretty good about that list as of today. I think I'd still have Lee Kemp above Snyder, but no real complaints there. For me, Burroughs above Baumgartner and maybe Smith if he gets another, because this ERA, at his weight, has been amazing. He's beaten some freaking hammers over years(pour one out for poor Sadegh Goudarzi, 3 straight finals and 3 losses, to Burroughs and Tsargush) and has won titles in 3 different Olympic quads. Baumgartner won titles in 4 quads and has just as many gold medals, 4 more silvers and 2 more bronze. Just one more DNP. One less college NC. 13 world medals is actually ridiculous. 2 Olympic golds, 1 olympic silver, 1 olympic bronze. Burroughs only has one olympic medal. That's the difference for me, even if '84 was kinda a freebie. Yeah, can't really count '84 as a serious criteria. Be like a world championship of American Football if we weren't there. GGCD and RockHardEnis39 like this. Very nice addition. Wonder why it didn't work out at Northwestern. Think I might try to follow some of the non collegiate wrestling going on this summer. 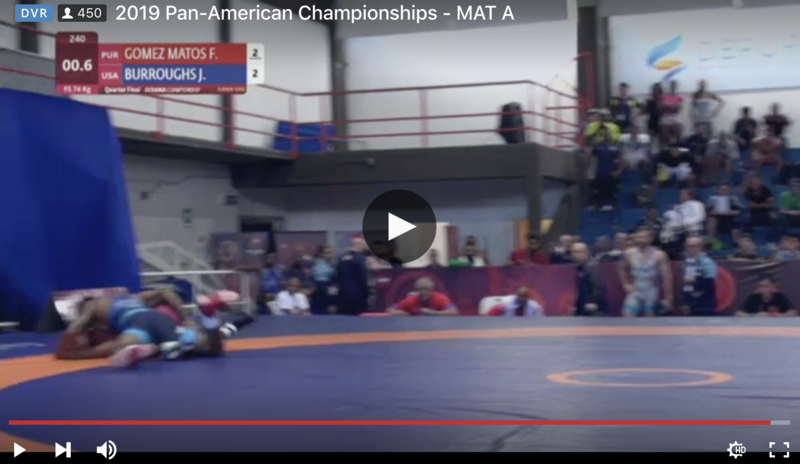 Is most everything streamed on Flo? How much is their service? Matt Parker transferring to PSU from Lehigh. He presumably will be the 125. Think it's $125 for the year. Flo is really your best bet. It's crazy the amount of content you get for that price. Most notably they will be carrying the US Open next week, then BTS, Last Chance Qualifier, senior WTT, and final X.
I think they also have Cadet/U23 trials, not sure about juniors. Meanwhile Trackwrestling is charging 20-30 bucks to watch one tournament. It's bonkers. edit: I will note that they do not currently own the rights for cadet/jr/sr worlds. You'll have to shell out to watch those. I shared this during worlds last year. Pay attention. Was hoping I could do a month or two. Looks like it’s $150/year. They must have bumped up the cost, it's been 125. 150 is still a steal. The amount of content you get for that money versus any other wrestling site is absurd. If you're ggcd and want all their radio shows and random wrestlers, it's a steal. I have it and not sure, absolutely want some of the major events but don't think I've used it in 4-5 months besides looking at rankings. Really hope these qualifiers deliver. GGCD, devine, RockHardEnis39 and 2 others like this. Was the competition poor? Seems like JB had the only close match.